Double sided patchwork quilt/rug. Mainly squares machined together in strips (8 across). Average square 22 to 24cms. One side has a large piece of dark grey woollen material. The materials for the squares include tweed, mohair,many woollens, tartans and cream blanketing all of which were scraps or from used clothing. The quilt was one of many made by Elsie Shephard at Rosewood NSW between 1957 and 1970. They were made for warmth on the children's beds. It is still owned by Elsie and still used. When my husband was seriously hurt in a road accident in 1956 he was in hospital for a year then another two years recovering until he was fit enough to get a permanent job. There were no Government handouts to needy families then so you had to do your best to balance the budget and make ends meet. Having a young family, people were very kind to me, giving me clothes for my children their children had grown out of that were in good order, some were slightly worn and needed patching. When my husband had a permanent job people still gave me clothing because I had six children, even though I could afford to buy clothes for them. Because of their kindness I could never say 'no'. I would thank them saying 'nothing will be wasted, I'll make use of what you have given me'. Being so cold at Rosewood I decided to make patch work rugs for all my children's beds out of garments I knew would never be worn, keeping my word 'I'll make use of what you have given me'. There was no design or pattern in anything I made, I just kept cutting things up into squares, then stitching the squares together into rows, then sewing the rows together. Whatever colour was in the bobbin I sewed with. I never lined the rugs as I had always sewn enough squares together to just fold the sewn rows over and have the rug doubled. I made some rugs for my husband to take camping. My eldest daughter slept in the coldest room in the house. One night I finished her rug, put a lining in it and put it on her bed when she was asleep. It was that heavy that during the night she woke up thinking an animal was on top of her bed! I took the lining out." Tumbling Block quilt made from pure silk ribbons, patterned and plain. The quilt edge follows the block shapes. The backing is polished cotton printed with flowers. Crazy patchwork quilt with small patches in velvet, silk, brocade and cottons most with hand embroidery over the seams. There are many motifs such as flowers, butterflies, birds also dates, initials and names of local properties. It is padded with a thin soft material and the replacement backing (old) is satin. There is a wide rose coloured frill on all sides. Small rectangular bed cover, probably child's or even doll's, made from rectangles of cream linen stitched together with hand sewn french seams. The top surface is decorated with small squares and rectangles of coloured silk, velvet, wool and cotton attached approximately 25mm apart, with 3 stitches in centre of patch to attach to background. Bright pink wool patches stand out. 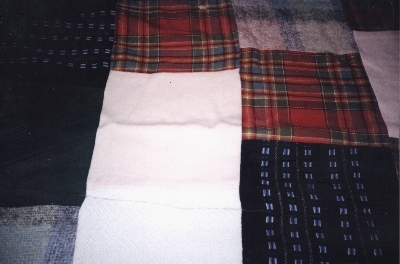 Utilitarian quilt made from large pieces of wool, flannel and cotton. Machine construction and the padding is wool.